The Quinnipiac Bobcats (1-0-0, 0-0-0 ECAC Hockey) will host the UConn Huskies (1-0-0, 0-0-0 Hockey East) at the Peoples United Center in Hamden, Connecticut. Both teams played their season openers on the road this past Saturday night. Quinnipiac is coming off 3-2 win against Vermont, and UConn is coming off a 5-2 victory against Army West Point. 2017 was a disappointing season for the Bobcats as they finished the season 16-18-4, and 6-9-1 at home. They will look to flip the script this year with a win in their home opener. UConn is also coming off a disappointing 2017 campaign, finishing the season with a 15-19-2 record. Sophomore forward Odeen Tufto is going to be a big part of the Bobcats moving forward. On Saturday against Vermont, Tufto capped off the Quinnipiac three-goal third period, as he scored the game-winning goal with 15.2 seconds remaining to complete the Bobcats 3-2 come-from-behind victory in Vermont. That goal was the tenth of his career and his fourth game winning goal. Expect Tufto to improve on his nine goals from last season and become one of the big-time scoring options for Quinnipiac. Freshman forward Ruslan Iskhakov recorded a goal and an assist in the win against Army. Ishakov is primed to be a top goal scorer for Uconn this season. Before UConn, Iskhakov played for Krasnaya Armiya Moskva in the MHL, the Russian U-20 League. He played in 33 games and scored 30 points, coming on six goals. He played for Team Russia’s under 18 team and had three goals in five games at the World Junior Championship. He was drafted in the second round of the 2018 NHL draft by the New York Islanders. Quinnipiac is going to have get in the net if they want to win against UConn. In 2017 Quinnipiac had a solid season in scoring, averaging 2.8 goals per game. Expect another year of experience to help Quinnipiac with the ability to score goals. 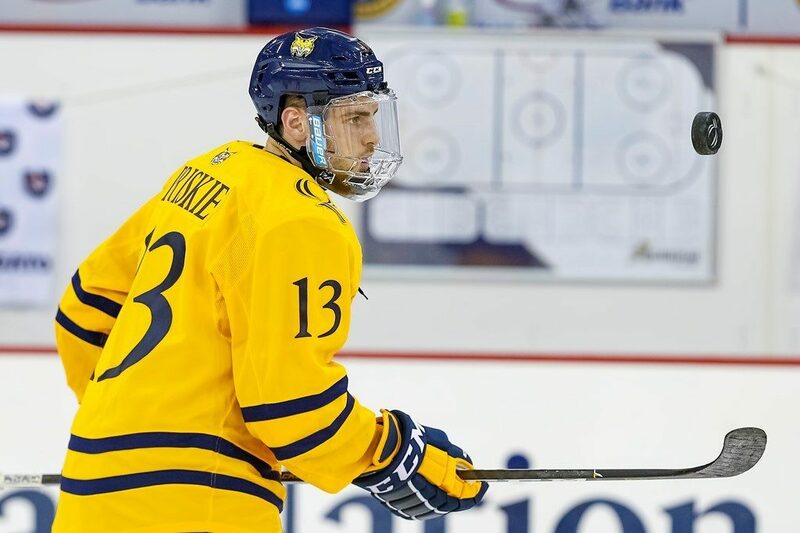 The scoring depth is where Quinnipiac will look to improve. Expect Alex Whelan, Odeen Tufto, and Chase Priskie to be the top goal scorers for the Bobcats. However, for the Bobcats to improve this season, they will need to find more scoring options. Junior goaltender Adam Huska had 32 saves in the 5-2 win against Army. He will need to continue to be solid between the pipes if the Huskies want to have a good season. Last season Huska was inconsistent. He in 27 games he had a 7-9-4 record with one shutout and a 2.87 save percentage. Make sure to tune in to QBSN’s live broadcast of Quinnipiac vs. UConn from the Peoples United Center Arena in Hamden, Conn. Make sure to join Matt McAuliffe and Max Schreiber on the call. For live updates throughout the game, make sure to follow @QBSN on twitter.